22-year-old Priscilla Ballantine is the beautiful youngest daughter of billionaire Thomas Ballantine. Cosseted and protected by her two older sisters, she's an artist, a dreamer. She doesn't have an adventurous bone in her body. So when she's despatched 200 years into the past, and wakes up stark naked in revolutionary France, only the awareness that she must rescue her beloved sisters puts steel into her spine. Priscilla's accused of spying, and is in danger of summary execution. She can't help thinking that she wouldn't be in such a mess if Dominick de Roche hadn't mistaken her for one of his contacts. Priscilla's horrified by her attraction to de Roche. Of all the dangers she faces, that may be the biggest danger. She can't fall in love with a man who in her own time, is long dead... Or can she? Priscilla's sisters, Tara and Molly, traveled across time too. Now they're back in their own time. Can they rescue their impractical, helpless sister trapped 200 years in the past? Does Priscilla even want to be rescued? 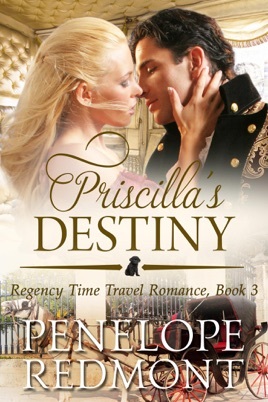 Priscilla's Destiny is the third book in our Regency time travel romance trilogy. Tara's Enchantment is the first book; Molly's Magic is the second. All three books can be read as standalones.